Color:White Includes 2 : For LEFT & RIGHT foot. Millions of people are suffering from hallux valgus deformities. Are you one of them? There's no need to continue suffering and enduring the pain. Bring on permanent bunion correction by wearing these bunion relief splints and feel the difference. It's the best toe straightener and most comfortable hallux valgus treatment splint you can use at home and in sleeping time. FEATURES: • Bunion Corrector is effective in relieving Hallux Valgus and Bunion Pain. • Walk around in these bunion protectors unhindered. • Bunion regulator helps stabilize arches by pulling the big toe from the second toe. • The Bunion Splint bunion pads has a soft and adjustable strap to adjust to your feet. • Bunion Corrector Cushioned splint is comfortable to wear during day or night while you sleep. • Bunion toe straighteners features quality hinged design provides you with flexibility. 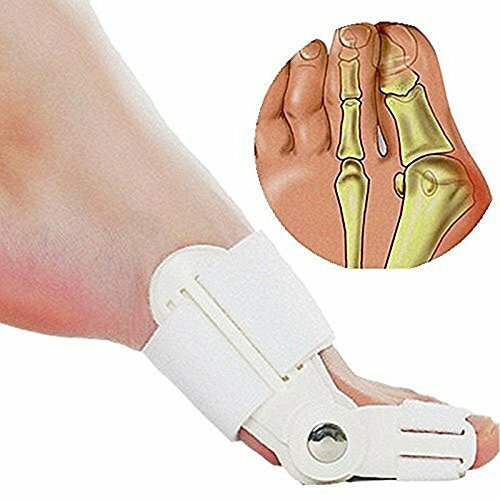 EFFECTIVE BUNION PAIN RELIEF:Allow for effective toe correction and bunion relief by using this bunion corrector toe splint, Helps ease the discomfort, pressure, and inflammation caused by bunions. ONE SIZE FITS All:Adjustable to provide a comfortable fit.These are geared for men and women alike. 24 HOUR USE: These bunion corrector can be worn for all day. The hinged bunion aid splint enables your toes and feet to move naturally while keeping their alignment. GUARANTEE: Offers no-risk, no-questions-asked money back guarantee. If you have any questions about this product by Hobbyunion, contact us by completing and submitting the form below. If you are looking for a specif part number, please include it with your message.